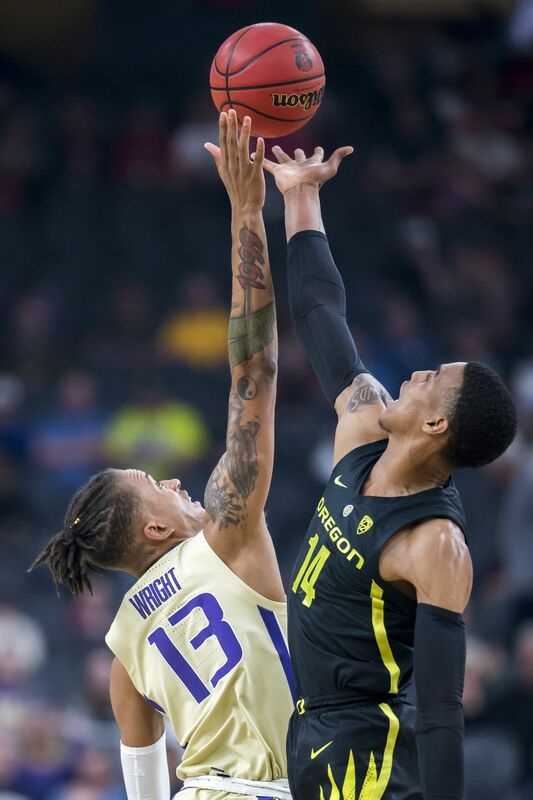 LAS VEGAS — The Huskies knew points would be difficult to find against a red-hot Oregon team that had allowed an average of 55.1 points during its seven-game winning streak. 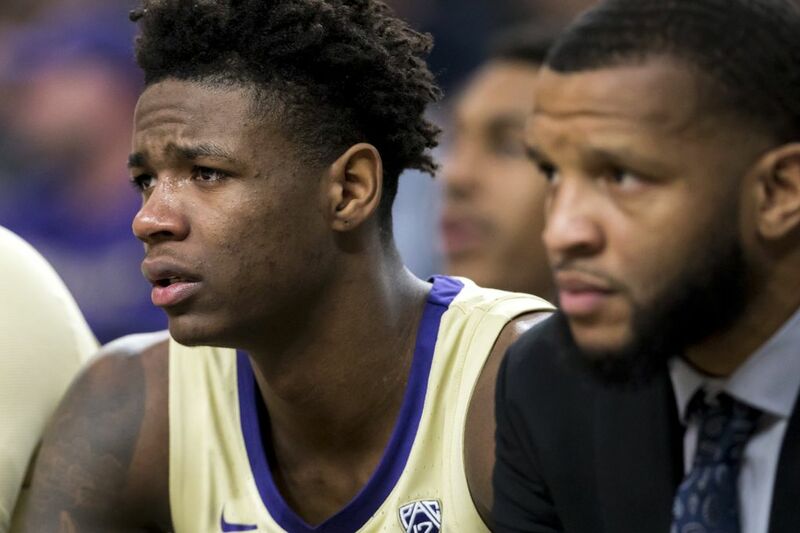 In their last encounter, Washington mustered a season-low 47 points during a defeat in the regular-season finale a week ago. 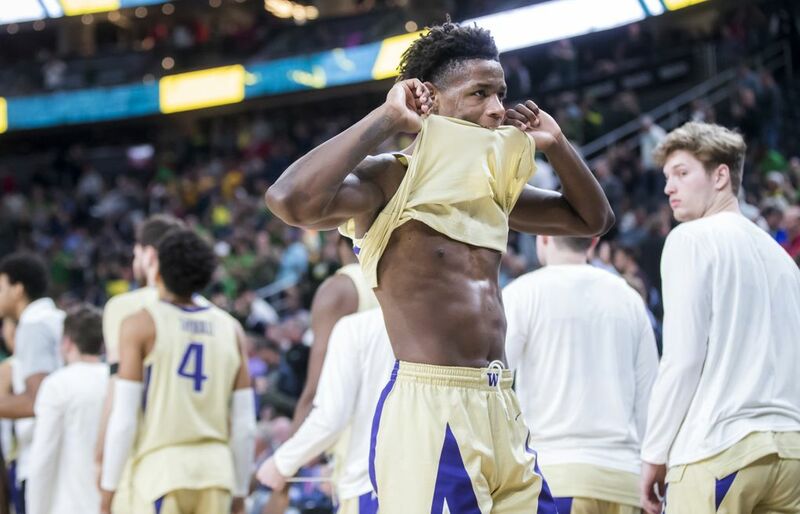 Saturday night, the top-seeded Huskies ran into another Oregon roadblock that ended their pursuit of adding a Pac-12 tournament title to their regular-season championship. 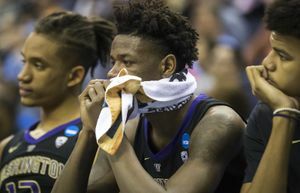 Washington’s 68-48 defeat — its most lopsided defeat against a conference opponent – looked eerily similar to many of its encounters with the sixth-seeded Ducks. 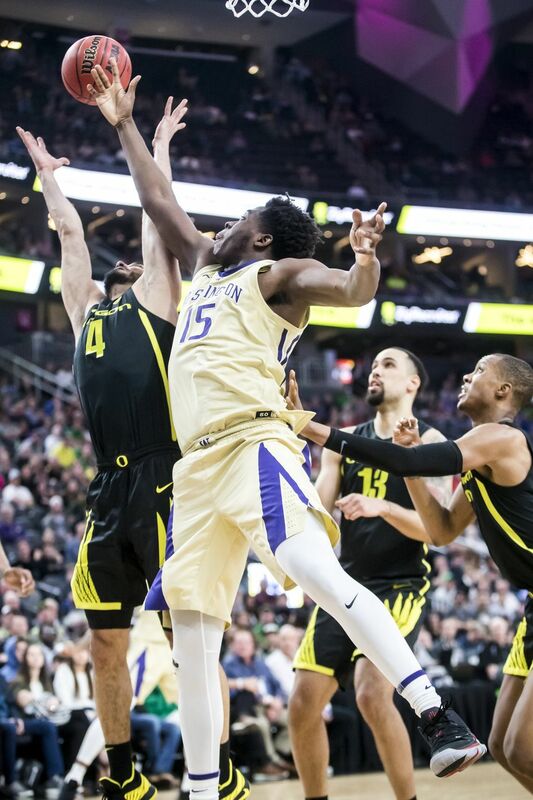 Oregon forwards Kenny Wooten, Francis Okoro and Louis King built an impenetrable fence around the rim that short-circuited UW’s offense, which shot 33.3 percent from the floor and 21.7 percent (5 of 23) on three-pointers. 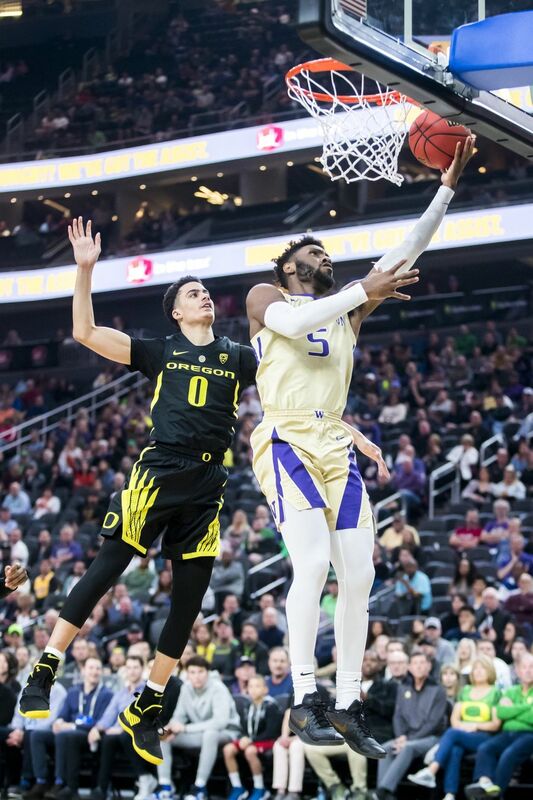 With Wooten patrolling the paint and blocking four shots, the Huskies had few viable offensive options against the Pac-12’s top-scoring defense. Jaylen Nowell, the conference’s player of the year, finished with eight points on 2-for-7 shooting. 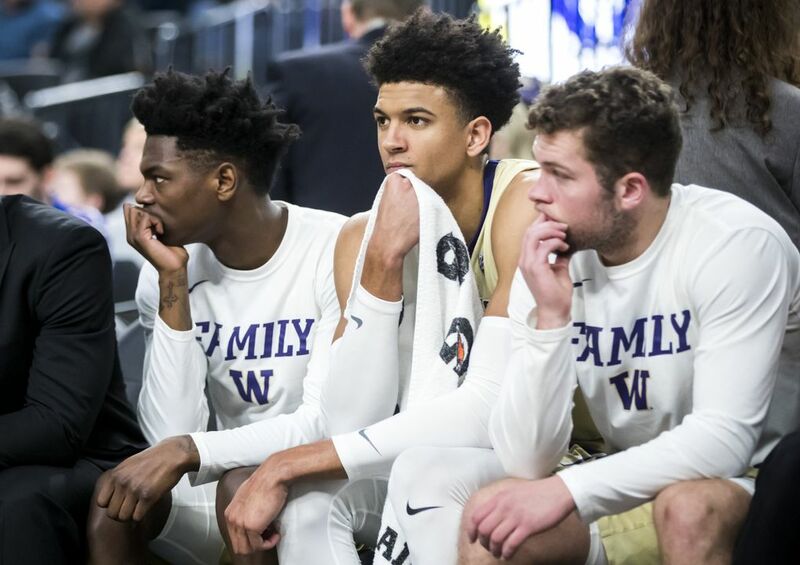 It was that type of night for the Huskies, who were outscored 40-22 in the second half and lost their third game in seven outings. 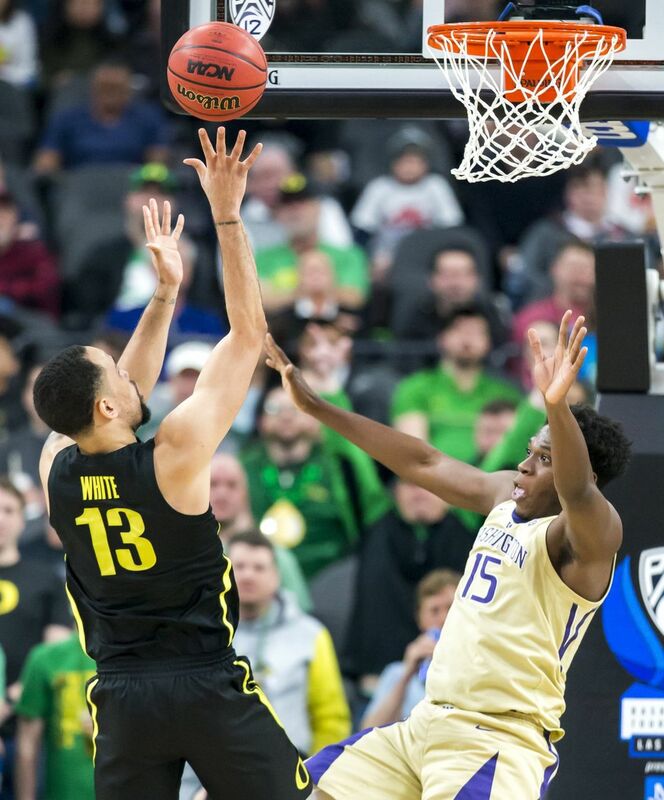 Washington was 7 of 8 on free throws – all in the first half – while Oregon hit 20 of 22. The Ducks made all 17 of their foul shots in the second half. 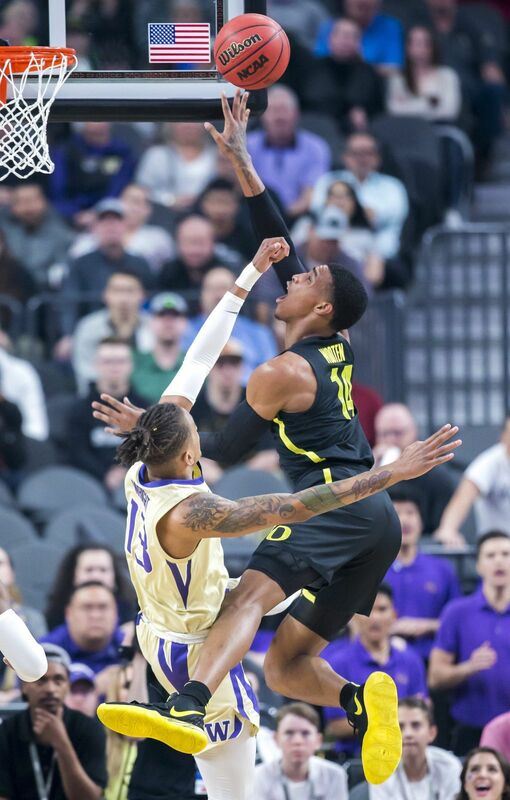 Despite playing their fourth game in as many days, the Ducks had the fresher legs throughout the night. Payton Pritchard, who was named the outstanding player of the tournament, finished with 20 points and seven assists – both game-highs. 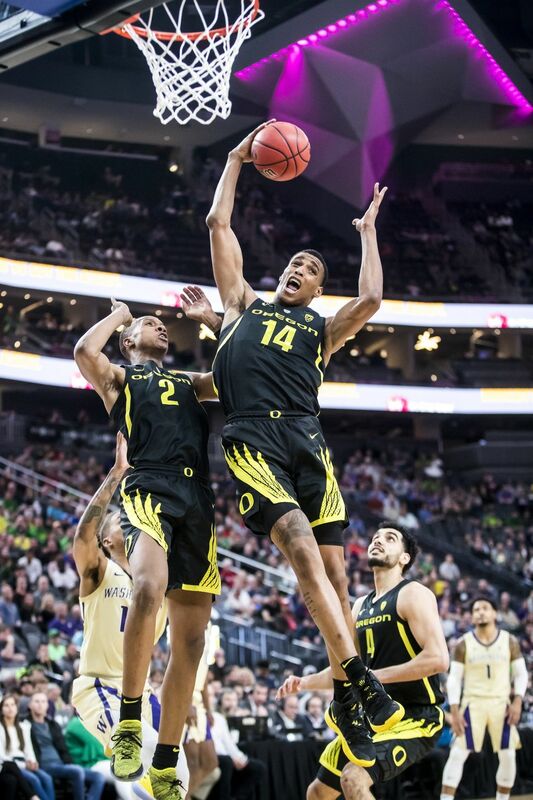 Louis King added 15 points and Paul White 14 for Oregon (23-12), which became the second team to win four conference tournament games to capture the Pac-12’s automatic berth to the NCAA tournament. 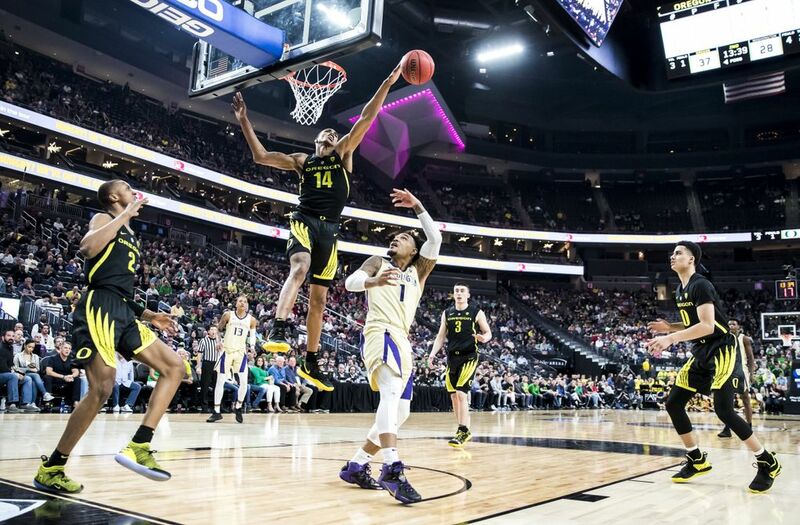 It’s a remarkable turnaround for the Ducks, who were 15-12 three weeks ago. 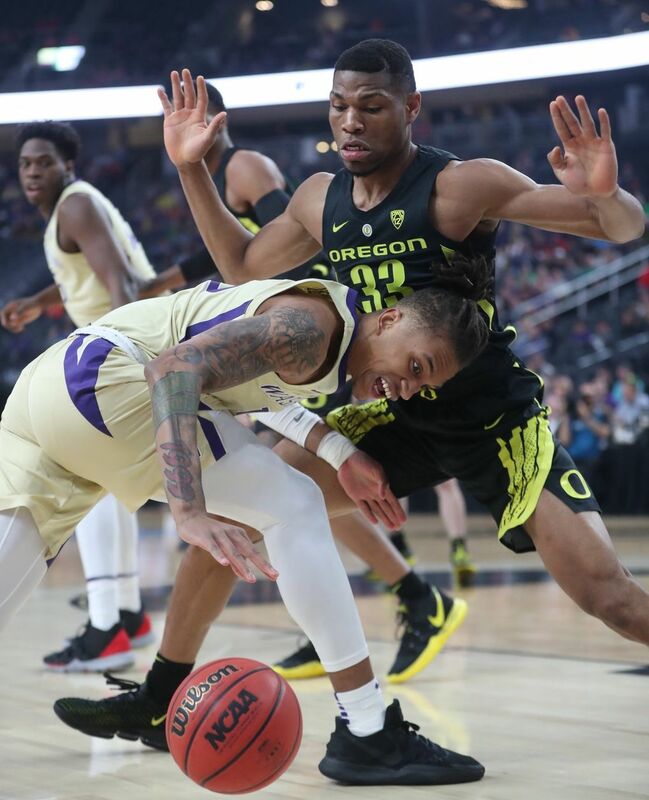 The Huskies trailed 28-26 at halftime, but they lost control of the game when the Ducks began the second half with a 20-7 run to go ahead 48-33 with 8:32 left. 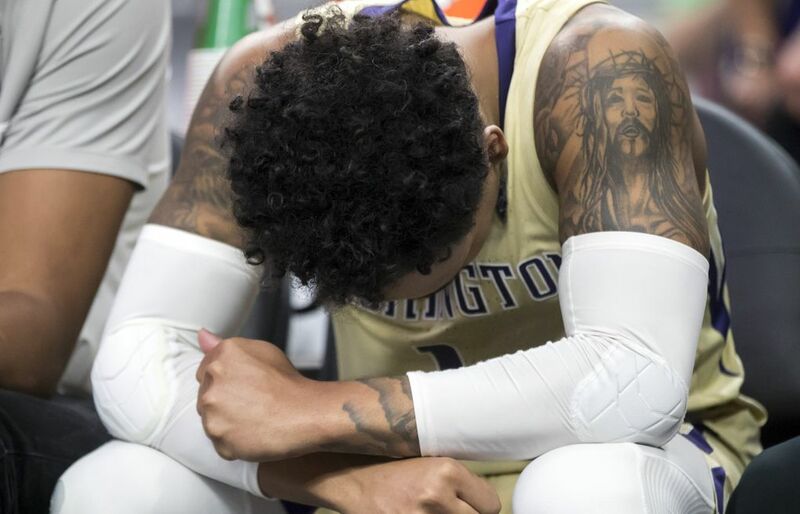 During the decisive stretch, UW had a 7:57-minute scoring drought and hit just 3 of 16 field goals, including 1 of 6 on three-pointers. 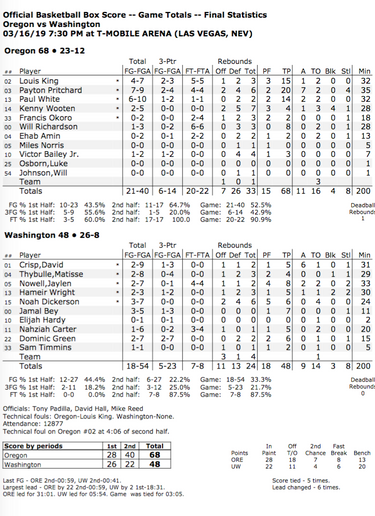 The entire second half felt like a long continuous sprint for Oregon, which at one point outscored Washington 30-11. “In the second half, we just couldn’t make a shot,” Hopkins said. 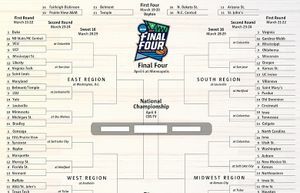 “You’re not going to win too many games shooting 22 percent from the field and 25 percent from three. 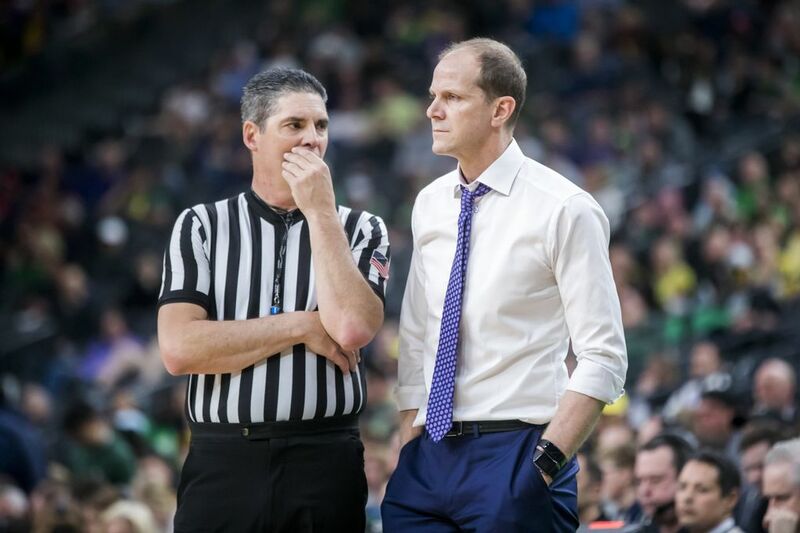 Pritchard flushed a left-handed breakaway dunk in the final minutes to deliver one last knockout blow to a staggering UW team that conceded the defeat and had many starters on the bench. 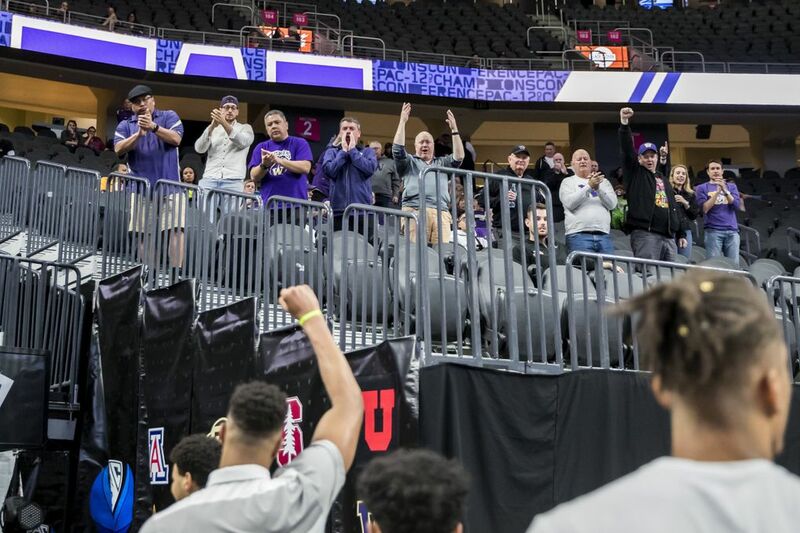 The Huskies (26-8) will gather at Hopkins’ house and to watch the Selection Show that airs at 3 p.m. on CBS expecting an at-large berth to the NCAA tournament. “Right now, obviously we’re all disappointed, but these guys are winners,” Hopkins said. “Losing stinks. Winning is great. And we didn’t get it done tonight. 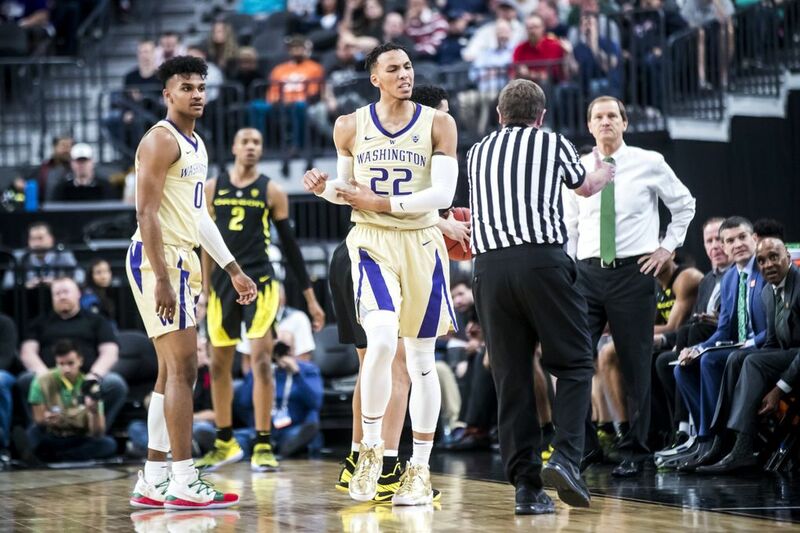 Washington’s Matisse Thybulle moved past former Oregon State star Gary Payton to become the Pac-12’s career steals leader (322). 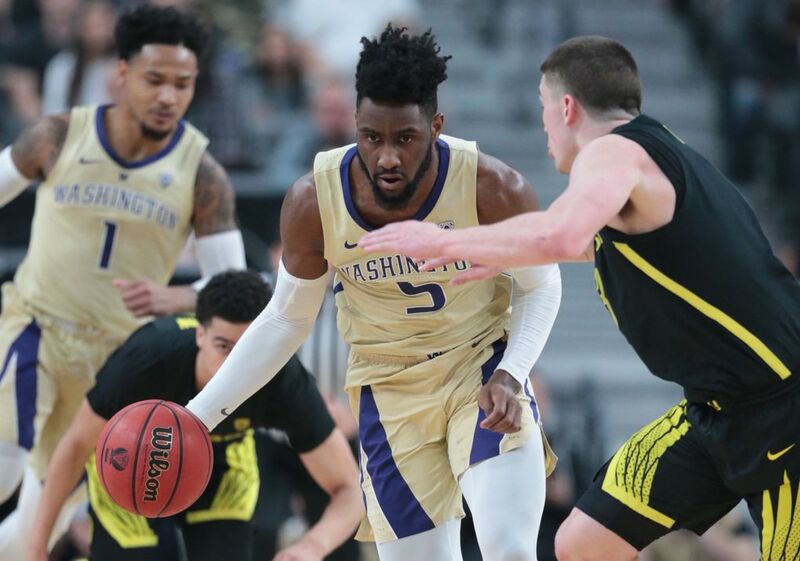 Nowell, Thybulle, King and Pritchard were chosen to the Pac-12 all-tournament team along with Arizona State’s Zylan Cheatham and Colorado’s McKinley Wright IV.